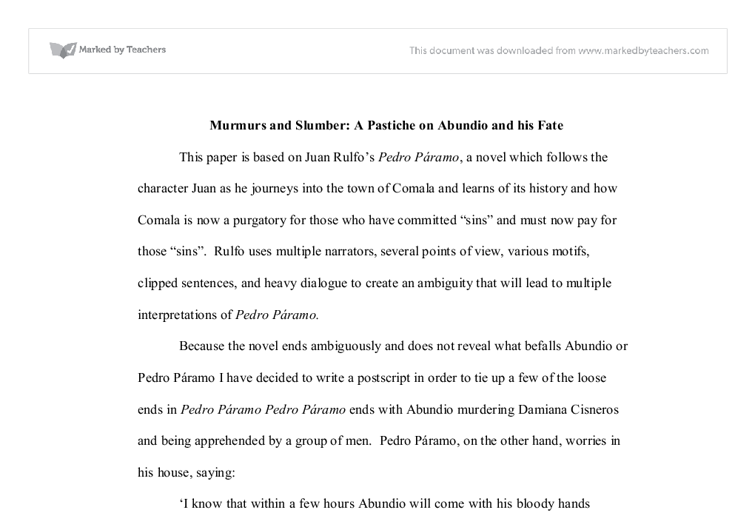 Murmurs and Slumber: A Pastiche on Abundio and his Fate This paper is based on Juan Rulfo's Pedro P�ramo, a novel which follows the character Juan as he journeys into the town of Comala and learns of its history and how Comala is now a purgatory for those who have committed "sins" and must now pay for those "sins". Rulfo uses multiple narrators, several points of view, various motifs, clipped sentences, and heavy dialogue to create an ambiguity that will lead to multiple interpretations of Pedro P�ramo. Because the novel ends ambiguously and does not reveal what befalls Abundio or Pedro P�ramo I have decided to write a postscript in order to tie up a few of the loose ends in Pedro P�ramo Pedro P�ramo ends with Abundio murdering Damiana Cisneros and being apprehended by a group of men. Pedro P�ramo, on the other hand, worries in his house, saying: 'I know that within a few hours Abundio will come with his bloody hands to ask for the help I refused him. But I won't have hands to cover my eyes, to block him out, I will have to hear him, listen until his voice fades with the day, until his voice dies' (124). 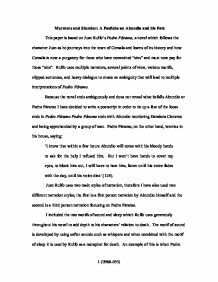 Juan Rulfo uses two main styles of narration, therefore I have also used two different narration styles; the first is a first person narration by Abundio himself and the second is a third person narration focusing on Pedro P�ramo. ...read more. allows the reader to be able to personally identify with imagery and be able to relate to what the character takes note of. The effect of dialogue in Pedro P�ramo primarily serves to allow characters to portray emotions while simultaneously revealing information. An example of this is the line, "I know that within a few hours Abundio will come with his bloody hands to ask for the help I refused him" (124). This exposes Pedro P�ramo's fears of Abundio and his regret for snubbing Abundio's earlier pleas for aid while also insinuating that Abundio will return to exact revenge, on which the following pastiche is founded. The pastiche begins with the events that would immediately follow Damiana Cisneros' death. I stared at my hands; they were bloody. I felt sick although I had already vomited. I stumbled along with my tired body. "Where are you taking me," I asked the men that were dragging me towards town. "Why did you do it? Pedro deserved it, but Damiana was innocent," they asked. "I don't know. I need to sleep," I said. I thought that it didn't matter. "Damiana Cisneros had stopped screaming now" (122). That was all I wanted. We had stopped outside the large Texas Madro�o tree near the middle of Comala. The dead town rose from its slumber and became alive with people. ...read more. I found that I had taken myself to Eduviges Dyada's house at almost the outskirts of Comala. I knocked stiffly and imagined a wooden and dull thump that would wake Eduviges. I imagined her walking lightly over creaking floorboards. The door opened. "Please, I need help; may I stay here for the night?" I said. Eduviges floated like a ghost down the hall and open a room. I walked in to the prepared room; it was as if she had been waiting for me. I looked at the bed and realized that I was tired. "I need to bury my wife." I told her. Again, she said nothing. "'Don't you hear me?' I asked in a low voice" (56). Her lips moved and no sound came out. She was voiceless like the sleeping patron. So then I really was soundless. The rain should be hammering on the roof. A mouse should be scratching in the corner. The low bay of bulls should sounding from the fields. Yet I heard none of them. But the echoes were gone. Eduviges left footstep-less. I lay down on the bed. I would get my burros back. I would still bring the mail, although I was deaf. I would no longer speak. "There wasn't much point in saying things [I] couldn't hear, things that evaporated in the air, things [I] couldn't get the taste of" (16). I closed my eyes and savored the thought of sleeping and beginning life again in the morning. "I slept fitfully" (32). ...read more. Thus, after Urara sees the moon in her garden, she regains hope and energy to keep on trying. Finally, I wanted to reinforce Yoshimoto's theme that one must move on from one's grief. This theme is most apparent in Satsuki's letter to Hitoshi, where she explains that the" flow of time is something I cannot stop. Someone comes to announce that her father has died, and like Pedro Paramo?s influence, the rain continues to fall as though it will never end. Finally, a day comes when the rain stops. However, the threat which the rain represents has not ended, since it has now been replaced by the wind.